La Buganvilla is a traditional restaurant offering Mediterranean cuisine. The average price of a main course dish at the La Buganvilla restaurant is 19 euros. The average price of a 3-course meal at the La Buganvilla restaurant is 40 euros. Note that although GoMadrid.com strives to maintain all information about La Buganvilla up to date, the prices mentioned are only an indication and may not reflect the exact value of your meal. 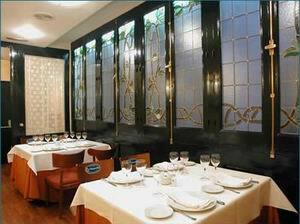 The La Buganvilla restaurant is located in one of the most stylish streets in the city. It specialises in Mediterranean food in general and in rice dishes in particular, with a wide selection of dishes created from top quality ingredients. You will be able to experience an authentic paella at this elegant establishment where only quality ingredients are used in the elaboration of freshly-cooked paella dishes. The restaurant consist of a main dining area and several smaller rooms often used for groups or for a more secluded environment. The maritime theme is maintained with a subtle nautical decor, and the level of quality and excellence is evident as soon as you walk in the door, all of which creates a very pleasant ambience to enjoy some excellent mediterranean cuisine. - soups, cured ham, cheeses, etc. The address of the La Buganvilla restaurant is: C/. Almagro, 12, 28010 Madrid. The nearest Metro station is Alonso Martínez. Please see the La Buganvilla restaurant location map below.